This first part of Really Useful Guitar Stuff forms the foundation for my whole method. Understanding basic music theory and putting it into practice right away, so helping you develop your understanding of harmony in a practical way. It's a workbook so you will be doing exercises to check your understanding and then putting it into practice. This pack is designed for people with very little knowledge of music theory and want to learn about how things work and also develop many useful practical skills that just a little music theory makes possible. It moves at quite a rapid pace so you need to take it slowly and make sure you understand each concept before moving onto the next. You should also make sure that you do all the answers in pencil so that you can rub them out and do them over if you are not getting it right. You will probably want to print out some of the blank papers from the resources section of the site to make the most of the practical examples - the more you do yourself the better you will learn it! There are lots of comments on the web forum. There is this thread and this massive thread and more here too. You can also PM people who have used it or are using it and ask them direct! "I'm only up to page 7 and the fretboard is already beginning to make sense to me! I highly recommend this book." 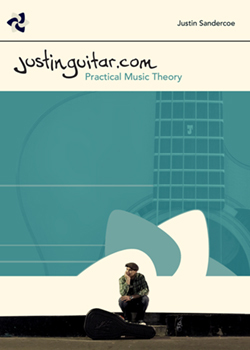 "Justin, this book had one of the most important pieces of theory in it that was lacking in my guitar knowledge previously. I now understand the major scale and the relationship between chords in those scales. As a result, I haven't stopped transcribing some of my favourite JF songs (and getting them right too). Before I bought this book, I was itching to start working out songs myself but had no theoretical knowledge on how to do it and your book answered the question I didn't know how to ask. You have taken my guitar playing to the next level through a basic understanding of theory and I thank you for that." "Awesome lesson guide. Extremely useful and extremely helpful. The explanations for some of the complex theory are explained in such a clear and understandable way that even I can learn it. The pages are great. A+"
"Justin I had hesitated to work on more than just cursory theory but after we met I knew I needed to take the plunge into the theory pool. Had I known (and probably should have realized) that you were going to break it down so that even I could get it, I would have jumped in a whole lot sooner. Very good job!! Thank you!" Written by Justin Sandercoe. All rights reserved ©2007-2016.